We know we all ready mentioned it a bit on here, but Kurt Vile’s in town tonight and he just put out a new video for the track “Jesus Fever” off his latest effort, Smoke Ring For My Halo [via Matador] The video goes along with the song pretty well. It’s lots of walking and dilapidated buildings and lighting and Kurt’s long hair and stuff. I mean, you can just watch it up there. If you’re not planning on hitting that show, then there’s definitely something else going on tonight that’ll be worth your time. 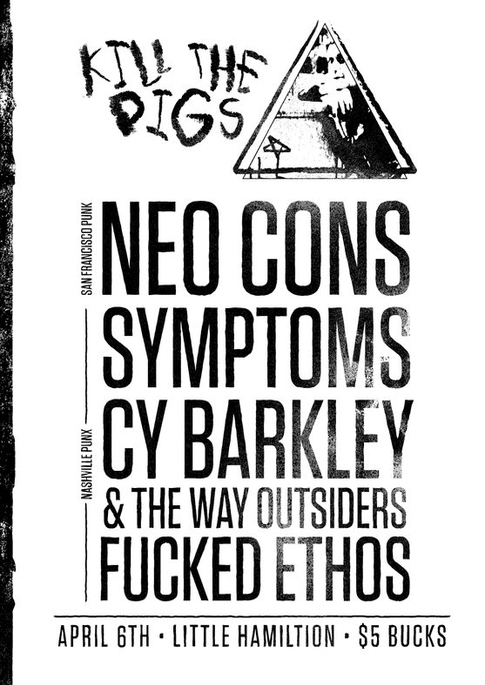 Neo Cons are in town from San Francisco and are playing Little Hamilton with Symptoms, Cy Barkley & The Way Outsiders, and Fucked Ethos [a new band featuring some of the Gnarwhal boys] The flyer for it can be seen after the click, it’s pretty sick. So there you go — two sweet shows going on tonight and zero excuses to stay home. Doo it.